you have to start by holding three of them.two on the bottom one laying in the middle of the two.weave the ribbon thru the holes and add as you go.Make on total citcle or just half. I did half and tied with the ribbon. This bracelet project suggests you use Indian Red Swarovski Crystals, which are the closest color Swarovski has to Pantone's Honeysuckle. Enjoy this project, and may it "lift your spirits"! This ingenious design fits beautifully around the wrist without the chains and beaded strand becoming tangled. Beautiful crystals make for a chic, sophisticated bracelet. String a crimp tube 1/2 inch from one end of beading wire; insert short wire tail through a jump ring and back through the crimp tube. Use crimp pliers to flatten the crimp tube. String the following beads: Indian red, jet, Indian sapphire and a silver spacer. Continue stringing beads in this pattern until the final Indian sapphire bead has been strung. String a crimp tube; insert wire through a jump ring and back through crimp tube and a few beads. Flatten the crimp tube. Trim excess wire. Open end links of rolo chains and attach to end jump rings on opposite sides of beaded strand. Close links. Open loop on an eye pin and slide onto one of the end jump rings; close loop. Slide eye pin through wide end of a bead cone. Note: Keep chains to each side of beaded strand and let them fall beneath as the eye pin is pulled through cone. Form a wrapped loop with wire extending from narrow end of cone; trim excess wire. Repeat steps 5-7 for opposite end of bracelet. Slide silver cross onto a head pin; form a wrapped loop. Trim excess wire. Use a jump ring to attach beaded head pin to one end of bracelet. Attach clasp to opposite end with a jump ring. The tree of life is a symbol which appears in a variety of different cultures. In most religions, it represents not only fertility and rebirth, but also the connection between the realms of earth and sky. It appears in Kabballah, as well as in sacred geometry. Within the Norse pantheon, some practitioners connect the tree of life with Yggdrasil, the World Tree. For many Pagans and modern Wiccans, the tree has personal meaning -- it often can symbolize rebirth and fertility, spiritual journeys, and growth. 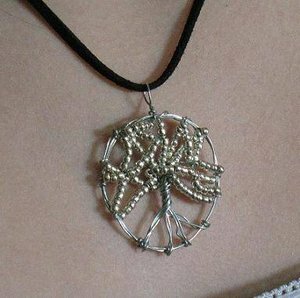 If you'd like to make a tree of life pendant to wear, you can make one like this with just a few basic craft supplies. The first thing you'll need to do is shape the outer circle of the pendant. The one in the photo is about an inch and a half wide, which seems to work well, but you can make it smaller or larger if you wish. To make your circle, wrap a length of wire around a broom handle or dowel rod twice, leaving a bit of extra wire on either end, forming a double circle. Slide the wire circle off the dowel rod, and wrap the extra length around the double circle so that your wire won't unravel as you bead. To form a ring at the top of the circle (which is where you'll thread a chain or cord through), simply twist a bit of the circle around the needlenose pliers before you secure the ends in place. Another option would be to slide a jeweler's "jump ring" onto the circle and crimp it with your pliers. To form the roots of the tree, you'll need to cut four equal lengths of wire -- 7 to 9 inches is plenty (you'll be trimming off the excess later). Fold each of these pieces in half. Position them equally along the bottom where the roots of the tree will be, and wrap them around the outer circle as shown in the diagram. Use the needlenose pliers to crimp the wires into place. This will leave you with eight pieces of wire sticking off your outer circle. The next step is to create the trunk of your tree. To do this, pull all eight of your wires into the center of the outer circle. Bring them together about a quarter to a third of the way into the circle, and twist them together as shown. Once the trunk has been twisted into place, fan the eight wires out to form the main branches of the tree. Thread your seed beads onto the wires, working with one at a time. Once you've put enough beads on a branch to reach the outer circle, wrap the wire once around the circle to keep it in place. Repeat this with all eight branches. Once you've filled in as much of the wires and beads as possible, use the needlenose pliers to weave any poky bits of wire into the design -- you don't want them jabbing you when you wear it! Trim off any excess strands of wire after you've woven them in. Add a chain or cord, and wear your new pendant! Treat yourself -- or someone special -- to a beautiful bib necklace with this simple project. Necklace How-To1. make a bib necklace template. Trace and cut necklace shape from two pieces of Ultrasuede or felt. 2. Arrange gems on fabric foundation, starting at center and working out. 3. Carefully coat back of each gem with glue and adhere to fabric. Let dry. 4. Cut ribbon into two equal-length pieces, keeping in mind that these pieces will determine the length of your necklace. Glue ribbons to each end of fabric for ties. Let dry. 5. If desired, turn necklace over and use invisible thread to anchor the gems. Coat second cut piece of Ultrasuede or felt with thin layer of glue and cover back of necklace, hiding the thread. 6. Using sharp scissors, carefully cut away extra fabric.